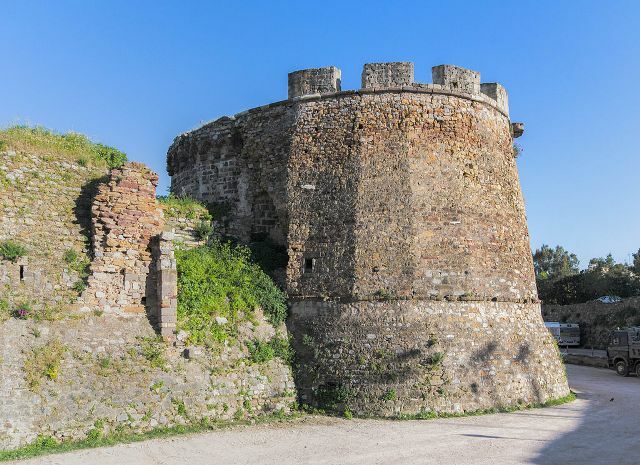 Notes: Castle of Chios is a medieval citadel in Chios town on the Greek island of Chios.The castle is situated adjacent to the main port of Chios and its east side borders with the sea. It consists of an inhabited area surrounded by a large stone wall structure with various fortifications purposed to defend the enclosed population and properties against naval attack and siege. The castle was constructed in the medieval period with its first construction phase having started in the 10th century by the Byzantines. The structures surviving to this day are part of later construction and expansion dated to the time when the Genoese, who maintained commercial concerns, ruled the island during the 14th to the 16th century.